Richard Jennings and Ralph Baker Dotson try out a new installation. allows you to reprogram basic functions from the panel. A pressure transducer replaces all but one of the float switches that would be used to do the same functions. The switches bypass the controls so that all systems can be manually tested. There is a simulation function to artificially change the level that the panel sees. This allows for testing of all functions of the panel without waiting for a rainstorm. The panel displays the level in any cistern in decimal feet (e.g. 4.3 ft) or in inches. Using the dimensions of your cistern, you can create a chart to determine the volume that is represented by the depth of water. If you provide cistern dimensions at the time of ordering, a chart will be provided for you. The red LED’s indicate the percentage of the tank that is full. 2. Addition of makeup water only as needed. Makeup water is added only when there is a call for irrigation and a deficit in storage. This means that makeup is added only as needed. 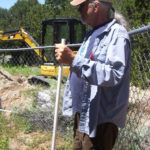 The cistern capacity is saved for rainwater collection. 3. Distribution of excess water to an override zone. 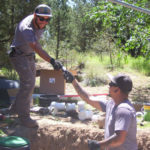 When a rainstorm fills the cistern, this function opens a solenoid valve and turns on the pump to transfer water to a desired area or another tank rather than spilling from the overflow. For irrigation, the panel is activated by the master valve signal from an irrigation clock. A programmable thermostat shuts off irrigation at operator selected temperature. In a hotter and drier climate, this allows year round irrigation with self draining irrigation zones. 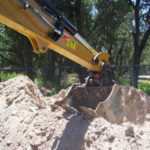 By recording changes in level after a precipitation event and the amount of precipitation, you can calculate the efficiency of a collection system. By observing before and after levels, you will know how much irrigation water is used by a zone. The control panel is designed for a owner specified voltage and pump horsepower. 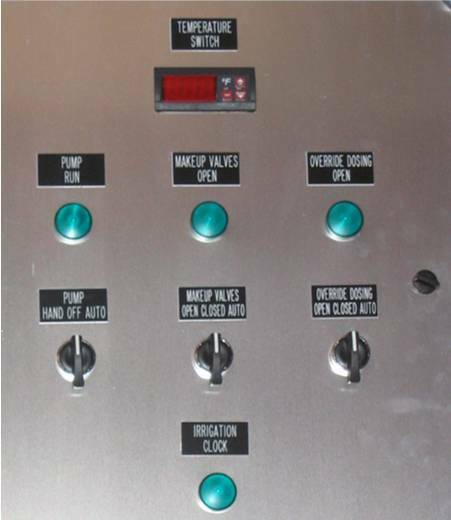 The panel is designed to control one or two pumps. Transducer and cable length are specified for each panel. Custom functions can be added by request. For example, a counter and recording water meter can be added to track overall water use. A second setup can meter the amount of makeup water added. This combination will allow you to also calculate the total rainwater collected. A manual describes how to set up and operate the system. Contact us for an order form and pricing. Our panel includes the basics functions to control irrigation functions when a certain amount of water goes through the treatment system. We call this panel “supply driven” because it operates on the supply of effluent water that is produced by your system. The panel uses float switches to activate the distribution. The level and tether length of the floats will determine what happens at different tank levels. All functions have indicator lights so you can tell what is going on by looking at the panel. You can also use the lights as part of troubleshooting. For irrigation, the panel is activated by a float switch that comes on at a certain level in the pump tank . A programmable thermostat shuts off irrigation at operator selected temperature. 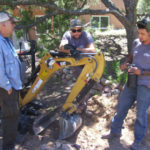 In a hotter and drier climate, this allows year round irrigation with self draining irrigation zones. 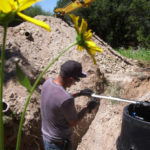 Self draining systems can be either low pressure dosed manifolds or drip irrigation. The drip tubing must be approved for effluent use such as Geoflow. Either system must be designed to drain between irrigation cycles. Both types of systems can also be alternated using a sequencer valve that waters on zone at a time and automatically switcheds to the next zone each time the pump comes on. The control panel is designed for a owner specified voltage and pump horsepower. 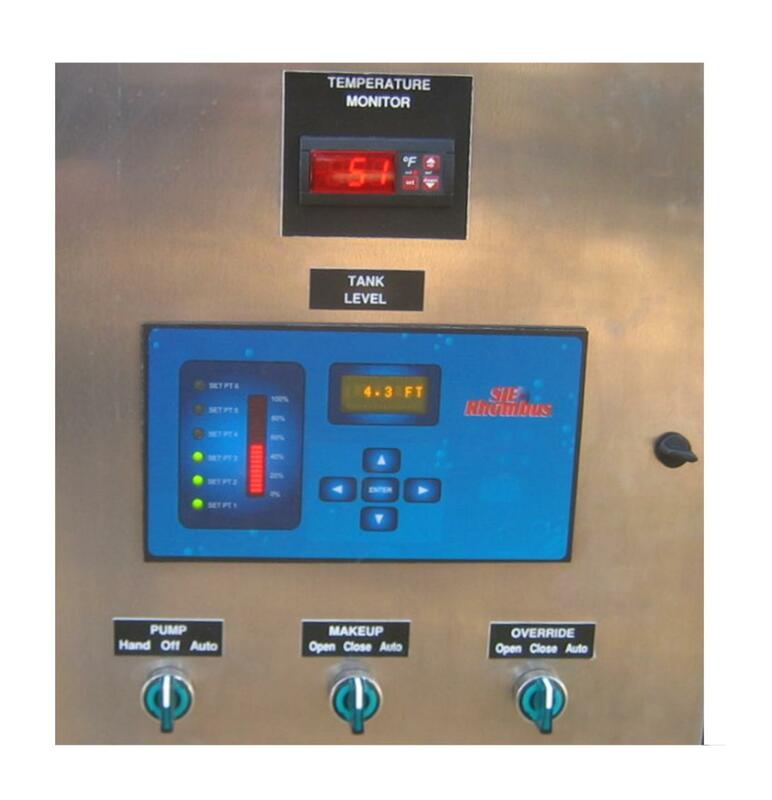 The panel can be provided to control one or two pumps. Custom functions can be added by request. For example, a counter and recording water meter can be added to track how much effluent you have reused. You may also want to choose between different temperature sensors. In some areas such as canyons, shaded areas, or north facing slopes, the air will warm before the soil. In these cases a soil temperature sensor will be required. Normally an air temperature sensor is needed and that is supplied with our stock panels. A manual is included that describes how to set up and operate the system. 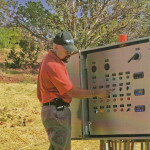 Our panel includes the basics functions to control irrigation functions when connected to an irrigation controller. We call this panel “demand driven” because it operates on the plants demand for water as expressed by the programming of an irrigation clock. The panel uses float switches to allow or deny the functions. The level and tether length of the floats will determine what happens at different tank levels. All functions have indicator lights so you can tell what is going on by looking at the panel. You can also use the lights as part of troubleshooting. Because the system is driven by an irrigation clock, there can be times such as a vacation, when there is not enough treated effluent. At those times, when the clock calls for water, makeup water can be added to provide just enough water to get thru the cycle. The pump tank is never filled with drinking water. There are other times when there may be a surplus of effluent. The system can be connected to an override zone to dose this surplus to plants that can use a bit of extra moisture. An example would be native plants in arid or semi arid areas.